Now to go with the super artificial flavored lemon cake, here is some super lemony frosting. I find with the french buttercreams, there are a couple of tricks. 1) you have to let it cool before adding the butter, I don’t always have patiences, but it is key. 2) You really need to whip it for a good 6-8 minutes once butter has been added, it looks soupy and lumpy before it become thicker and smooth. I always am nervous it won’t work out but then I continue to whip and somehow it comes together in the end, just how I wanted it! In a sauce pan melt the sugar and water stirring occasionally until it reaches 238 F. Remove and pour into a heat proof bowl to stop the cooking. 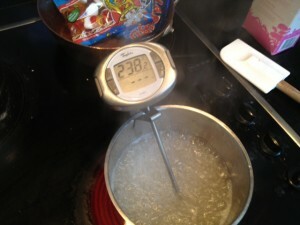 While the sugar is cooking, whip the egg yolks and eggs on high until fluffy about 5 minutes. Slowly pour in sugar and continue whipping for 5 minutes adding the lemon extract and food coloring. 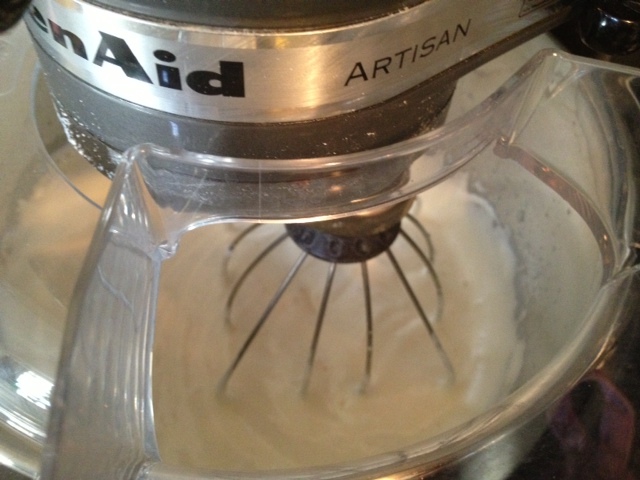 Once the mixture has COOLED completely add the butter in a little at a time. 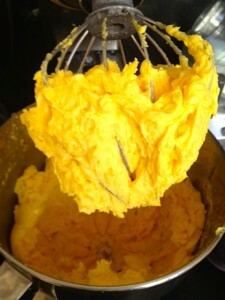 (Cut the butter into little pieces) And continue to whip on high until it is smooth. This could take up to 7 or 8 minutes. And now ready to frost the Lemon Cake! Looks and sounds yummy. Do you whip the egg whites first, and then add the egg yolks and continue whipping? Not clear on that part. Hi Sally- You whip the eggs and the yolks together.